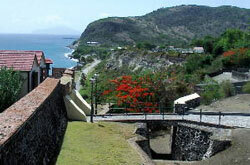 St. Eustatius, also known as Statia, is a Dutch island with a fascinating history. During the 1700s, the capital, Oranjestad, was a major port for slave traders and merchants who came to trade slaves, sugar, and cotton. Lack of rainfall made it difficult to grow crops, so Statia became a tax free center of trade, both legal and illegal, with a protected harbor near other islands and sea lanes. During this period of prosperity, Statia was nicknamed the Golden Rock. At one point, the island was home to about 20,000 residents, but the economy declined after 1776, when England punished St. Eustatius for recognizing the United States during the American Revolution. By the end of the eighteenth century, planters and merchants had left Statia, and it became a quiet island. The St. Eustatius Historical Foundation is working to present Statia's historical significance as the "Golden Rock". Geographically, St. Eustatius is a largely undeveloped volcanic island lying northwest of St. Kitts. Much of its coastline is quite rugged, but some inns and restaurants are available for tourists. Scuba divers are drawn to Statia to explore a hundred sunken ships, while others come to climb the Quill volcano and see the lush forest growing from its crater. In Oranjestad, history buffs will enjoy touring Fort Oranje, the Dutch Reformed Church, and the St. Eustatius Historical Foundation Museum.